If you’ve put off the task of banishing your cooker’s baked-on grease, grime, and crud because commercial products are unpleasantly harsh, try this all-natural homemade formula. It’s common to ignore oven spills and splatters until you can’t avoid seeing—or smelling—them on the walls, racks, and window glass. 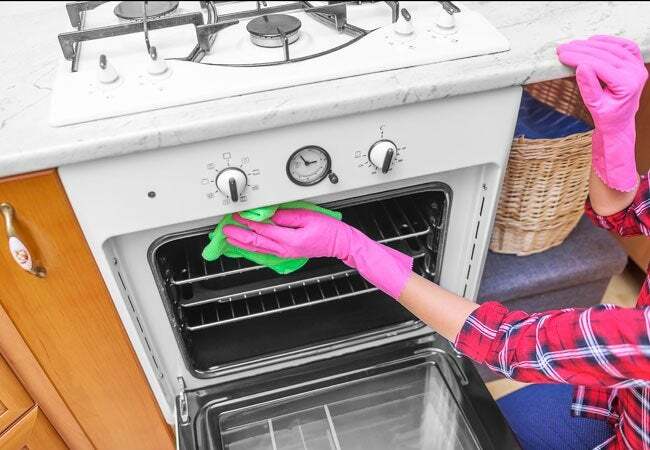 Yet you needn’t resort to strong chemical solvents to get your oven sparkling again. This totally non-toxic, inexpensive formula is a snap to mix up and it really works. All it takes is a bit of pre-treating and proper application techniques. You’ll be back to baking, braising, and roasting in no time. In a glass bowl, combine two cups baking soda with three-quarters cup water. For a fresh but not overpowering fragrance, add eight to 16 drops of your favorite essential oil. Lemon, by itself or mixed with lavender, is particularly nice for the oven. Just be sure to steer clear of metal or plastic bowls, which could react badly with essential oils. Mix with a spoon until a thick but spreadable paste the consistency of slightly gritty cake icing forms. Make sure that the oven is off and completely cool before you bring in your homemade oven cleaner. Then pre-treat the individual components to loosen built-up grime and make them easier to wipe clean. • Remove the racks and lay them as flat as possible in an empty sink. Sprinkle with enough baking soda to form a layer, approximately one-eighth inch thick, on the rack, then spritz with vinegar from a spray bottle. When the baking soda stops foaming, fill the sink with hot water to submerge the racks overnight. • Using a metal spatula, gently scrape food residue from the sides and ash from the floor of the oven chamber. Then, taking care to avoid the heating elements (usually located on the roof and floor of the oven chamber), spread the homemade oven cleaner over all visible interior surfaces, including the back wall. Let the oven absorb the baking soda paste for six to eight hours. • After the paste has had its chance to work, open the door flat and spread the remaining homemade oven cleaner evenly over the surface of the window glass. Give it only 15 minutes of dwell time. To protect your kitchen floor from liquids used in these next steps, spread newspapers all around the oven. Then, tackle the window glass first. Wipe it down with a damp microfiber cloth to banish grime. To remove any residual baking soda paste, rinse the glass with water and wipe dry. 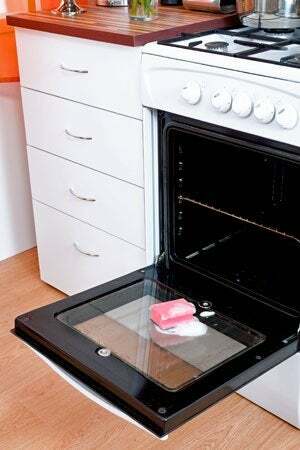 Using a damp sponge, wipe the surfaces of the oven chamber. Start with the sides, then move to the back of the chamber, wiping these surfaces from the top down to allow ash chunks to fall to the floor of the chamber. Then, taking care to avoid the upper heating element, wipe the roof of the chamber from back to front. Lastly, tackle the floor of the chamber using back to front motions. Rinse the sponge as needed with clean water and repeat until no baking soda remains. Drain the sink and scrub the oven racks with a dishrag to remove debris. Rinse and dry the racks before replacing them. Discard the soiled newspaper—and break out your favorite recipe!